A touching subject matter and an excellent example of the work of one of Britain's most famous 18th Century painters. George Morland lived a very full and prolific life. He exhibited at the Royal Academy at the very young age of 10, and escaping from his father and taskmaster who apparently kept him virtual prisoner, making him draw and then selling his works and keeping the money, he went to Margate where he continued and developed his taste for a rollicking lifestyle of excess. Morland is infamous both for his excesses and for his skill as a draughtsman and his works are extremely sought after and well represented in National museums and private collections. Posted on June 7, 2016 by Nigel Rhodes and filed under 19th century, Country: British, gilt, Oil on Board, Period: 18th Century, Period Eighteenth Century, Type: Genre, Type: Painting and tagged Country: Britain nigel rhodes nigel rhodes fine art fine art dealer child mother and child domestic. 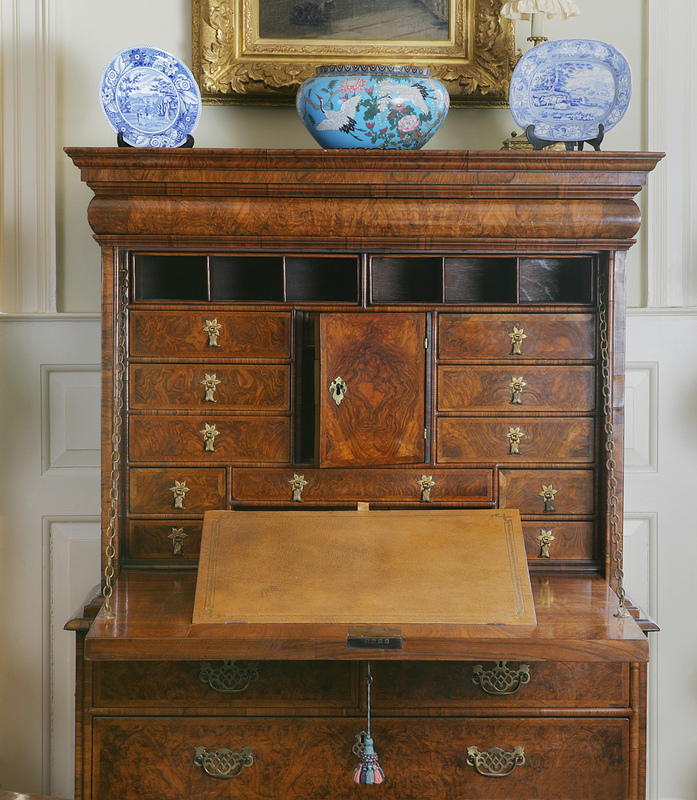 With reverse ogee moulded cornice above a cushion frieze drawer, over a fall enclosing four secret drawers behind two pull out compartments comprising six pigeon holes, with eleven drawers below and a gilt tooled leather inset writing slope to the underside of the fall, above two short and two long drawers, on large bun feet. Posted on June 7, 2016 by Nigel Rhodes and filed under type: furniture, Period: 18th Century, Period Eighteenth Century, Type: Desks & Bureaus and tagged walnut furniture desk antiques nigel rhodes fine art fine art dealer. A Study of a Sporting dog, probably an early breed of Pointer, in a landscape. Philip Reinagle was a member of a family of painters. He studied under Allan Ramsay (1713-1784) working mostly on portraits. Breaking away from this, Reinagle went on to become very successful in painting sporting dogs, birds and game. In 1787 he was elected an associate of the Royal Academy and in 1812 an Academician. He frequently exhibited at the British Institute. In 1787 at the Royal Academy, he exhibited a landscape painting 'A view taken from Brackendale Hill, Norfolk' and from then on concentrated his efforts towards landscape. Reinagle's best drawings for book illustration were those of dogs for William Taplin's Sportsman's cabinet (1803), which were engraved by John Scott. NB: We are grateful to the Kennel Club for identifying the breed of dog depicted in this work and to Hugh Belsey (Senior Research Fellow, Paul Mellon Centre for Studies in British Art, London) for confirming the attribution based on photographs. Works by Philip Ruinable are widely collected and can be found for example, at the Victoria and Albert Museum, London, The National Gallery, London and The Tate Gallery, London. Posted on June 3, 2016 by Nigel Rhodes and filed under Country: British, Oil on Canvas, Period Eighteenth Century, Period: 18th Century, Type: Painting, Type: Sporting, Type: Shooting and tagged sporting dog landscape oil on canvas pointer nigel rhodes fine art fine art dealer. 49 x 54cm / 79 x 73cm Hand Carved Original Frame. George Lance: Victorian Master of Still Life. In his seminal work Victorian Painting (1966), Graham Reynolds stated that the revival of still life painting, as an artist's main preoccupation, was effected almost single-handedly by George Lance. Over one hundred years earlier J.M.W. Turner had expressed the view that Lance was one of the three greatest colourists of his era. Lance was born in Essex. A conversation with Charles Landseer, who Lance happened upon in the British Museum, one day, led to his becoming a pupil of the well known Benjamin Haydon, a huge figure in the world of Victorian painting at that time and with whom Lance stayed for the next seven years while also studying at the Royal Academy. A coincidental choice by Lance to paint fruit and flowers as an exercise attracted the notice of Sir George Beaumont and this success led him to paint another which he sold to the Earl of Shaftesbury. He went on to sell works to the Duke of Bedford as decorations for a summer-house at Woburn Abbey. From thereon he decided to devote himself to still-life painting. Posted on June 3, 2016 by Nigel Rhodes and filed under Country: British, Oil on Canvas, Period Eighteenth Century, Period: 18th Century, Type Animal, Type: Painting, Type: Still LIfe and tagged still life cow stable door milk bowl nigel rhodes fine art fine art dealer. A beautiful pair of porcelain figurines - A Shepherd and a Shepherdess, with stunning detail and colour. Posted on June 3, 2016 by Nigel Rhodes and filed under Country: British, decorative, Decorative, Period Eighteenth Century, Period: 18th Century, Type: Decorative, Type: decorative, Type: Porcelain and tagged porcelain shepherdess sheep nigel rhodes fine art fine art dealer. A beautiful original gilt wood George II mirror in excellent condition. Posted on June 3, 2016 by Nigel Rhodes and filed under Country: British, decorative, Decorative, Period Eighteenth Century, Period: 18th Century, Type: Decorative, Type: decorative, type: mirror, gilt and tagged george II gilt mirror antique fine art dealer nigel rhodes fine art. An exquisite example of Morland's hand. The famous painter, known for his skill and his lifestyle, here gives us a beautiful intimate painting. It is in excellent condition and the frame is original. George Morland lived a very full and prolific life. He exhibited at the Royal Academy at the very young age of 10, and escaping from his father and taskmaster who apparently kept him virtual prisoner, making him draw and then selling his works and keeping the money, he went to Margate where he continued and developed his taste for a rollicking lifestyle of excess. Morland is infamous both for his excesses and for his skill as a draughtsman and his works are extremely sought after and well represented in museums. Posted on June 3, 2016 by Nigel Rhodes and filed under 19th century, Country: British, Oil on Canvas, Period Eighteenth Century, Period: 18th Century, Type: Genre, Type: Painting and tagged genre nigel rhodes fine art fine art dealer gilt. A very fine example of the work of one of Britain's most famous 18th Century painters. George Morland lived a very full and prolific life. He exhibited at the Royal Academy at the very young age of 10, and escaping from his father and taskmaster who apparently kept him virtual prisoner, making him draw and then selling his works and keeping the money, he went to Margate where he continued and developed his taste for a rollicking lifestyle of excess. This particular painting is exemplary of Morland's artistry in its' detail, composition, size and colour and included here a white horse, somewhat of a signatory of Morland's. Posted on June 3, 2016 by Nigel Rhodes and filed under 19th century, Country: British, Oil on Canvas, Period Eighteenth Century, Type: Equestrian, Type: Painting, Type: Genre and tagged equestrian horse Genre stable english landscape collecting fine art gilt frame period fine art dealer nigel rhodes fine art. Richard Barrett Davis was an important Victorian Horse painter and landscape artist, born in Watford in 1782. In 1789 his father became a huntsman to George III's private harriers and it was through him that Davis' sketches caught the attention of George III who in turn persuaded Sir Francis Bourgeois (1756-1807) to tutor the young Barrett Davis. He studied at the Royal Academy Schools where he first exhibited in 1802. He joined the Society of British Artists in 1829 and was appointed animal painter to William IV in 1831. From 1802 Davis exhibited annually at the Royal Academy for the next fifty years and from 1808 he exhibited at the British Institution and also at the Society of British Arts in 1831. The subject of this painting was also the name of a loveable if slightly ridiculous English Squire character from the Spectator (1711) who represented the values of an old country gentleman, making typical Tory politics of such a person harmless but silly. It is also the name of an English country dance. Posted on June 3, 2016 by Nigel Rhodes and filed under Country: British, Oil on Canvas, Portraiture, subject: Portrait, Type: Painting, Type: portrait, Type: Sporting, Type: Equestrian, Period Eighteenth Century and tagged Equestrian Hunting Hunt horse hounds country squire Country: Britain collecting fine art country estate English Aristocracy fine art dealer nigel rhodes fine art.